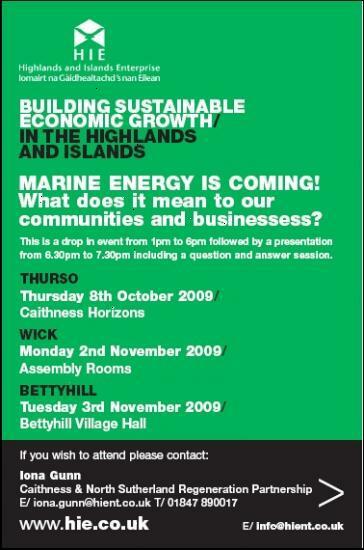 Drop in events for you or your company to find out more about what Marine energy might mean for Caithness and Sutherland. Highlands & Islands Enterprise and the Pentland Firth Marine Energy Project are holding a series of local drop in events and presentations about marine energy opportunities and what this may mean to our communities and businesses. The first event follows the Caithness Conference and will be held in Caithness Horizons on Thursday 8th October. The subsequent two events are during the first week of November in Wick (Assembly Rooms Monday 2nd) and Bettyhill (Village Hall Tuesday 3rd). All events have a drop-in from 1 to 6pm followed by a presentation from 6.30pm which gives an opportunity to share views and hear the views of others in the subsequent Q&A session. Please note that children are more than welcome at the drop-in events and older children may be interested in hearing the presentation.